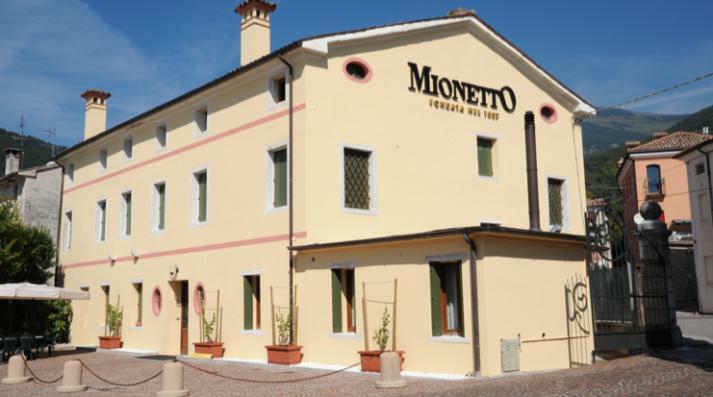 Mionetto has been Italy's foremost producer of Prosecco wines for more than 125 years. The winery was founded in 1887 by Francesco Mionetto in the small village of Valdobbiadene, located just north of Venice. On the steep hillsides of Valdobbiadene, the delicate Glera grapes (formerly called Prosecco) found ideal soil and climate conditions. At first Francesco bottled and sold wines to the locals of the region. He used small casks and transported wines by horse and buggy throughout the town. His brothers eventually joined him in the business and it became even more established. However, all three brothers were called to serve during WW1 and the winery was left unattended and sustained heavy damage. Francesco's grandsons, Giovanni and Sergio Mionetto, took over the winery in 1961 and began re-building. In 1982, the Mionetto family introduced autoclave fermentation by switching to the Charmat method, which allows for better preservation of the flavors and aromas of Prosecco. Prosecco is an especially challenging wine to produce because of historical ownership laws in the region. Wineries traditionally do not own their vineyards or own very little and most Prosecco vineyards are small, ranging in size from only 1-4 hectares. It is the winemaker's job then not only to produce a high quality sparkling wine, but to maintain the relationships with local farmers who provide the grapes. Mionetto is fortunate to have relationships with vineyard owners that date back for generations. Many of the farmers have been working with Mionetto for over 40 years. The strength and longevity of these relationships can affect the quality and quantity of grapes provided to a winery. These relationships have been passed from generation to generation within the Mionetto family.